We’d love your help. Let us know what’s wrong with this preview of SeQuence Entangled by Lorraine M.L.M.. 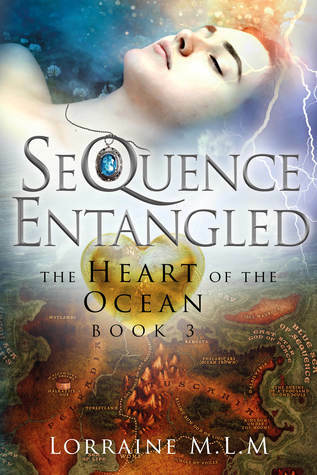 Preview — SeQuence Entangled by Lorraine M.L.M. Her words, “Protect the womb—safeguard the see Politics or Love? Prophecy or Truth? Dreams or Reality? To ask other readers questions about SeQuence Entangled, please sign up. Author: Lorraine L. M. L.
Review: So, after rating the first two books in this series 4*’s I was expecting many things from SeQuence Entangled and Lorraine didn’t disappoint. The opening to Entangled, explains a little better what the SeQuence is and what it means for Lessi, our heroine. As this is the 3rd book in the series, I am not going to go into too much detail, so I don’t spoil books 1 & 2 for new readers but I will be providing some general thoughts on what I thought of the book overall. The openings to this series aren’t as interesting as you would find in books of a similar genre, but they do play vital roles further on in the novels. These openings, however, are intriguing. In the second book death played a key role in the whole novel and the opening, the theme here was entanglement and I was very curious to see how this theme would be worked into the novel. There is also a secondary theme of enlightenment or achievement of a goal and I was also intrigued to see where this theme would lead. All the characters from Dante and Lessi to minor characters like Toras and Raquel are very well fleshed out with compelling character arcs that intertwine at the most unexpected moments. You definitely know which characters to root for and even the ones you want to hate like Jizu you have to feel sympathetic towards because of their circumstances. All the characters feel very real although at times some act very out of character for the archetypes you have created. Two of these are Dante and Lessi, at times Dante is completely arrogant and cold towards everyone even the one he claims to love, while Lessi is deceitful and comes close to cruel at times. These scenes seemed completely out of character for these particular characters and made the scene feel off, but it doesn’t have a huge impact on the novel as a whole. One major issue I had with this novel was the relationships involve. Two massive relationships that I had so many issues throughout this novel was the relationship between Lessi and Jad and the relationship between Jad and Dante. For Jad and Alee’s relationship I felt that since their return there was a much stronger, healthier between this pair than between Dante and Lessi and I was rooting for them only to be teased and shot down repeatedly and it got to the point that I became less and less invested in Dante and Lessi’s relationship and the insta-love connection they share. It seems to me like Lessi is clinging to Dante because she herself like Jad has been deprived of love for so long when the person she truly loves is Jad, she just seems scared to admit this. We are also aware of Lessi’s constant need to please those around her and that she wants to be with Jad more than Dante although the story wrestles you back to the original romance, which just doesn’t make sense anymore. The external conflicts are well defined for the main group as they are the same from the Silent Sleepers waking up to the collapsing shield and these story arcs are given plenty of time and development through the series in the shield’s case. I would have like a little more history of the Silent Sleepers or at least one appearance of them to determine their power. As being told something is powerful and seeing something is powerful are two completely different things. For example, Lessi is told that Lord De-Deganon is a horrible, cruel person but she doesn’t quite believe it until she witnesses this first hand, and this should also be the case with the Silent Sleepers. The internal that is the love triangle between Lessi, Jad, and Dante. I believe that Lessi either needs to end up with Jad or that a compromise is found where she can be with both of them as she loves them equally in the same way in my opinion. I also felt that the conflict between Lavia and Dante should have been given more time and would have benefitted from an ultimatum where they literally can’t continue their journey unless Dante honors his original agreement. This solves the other relationship issue, if Dante was forced to honor his agreement to Lavia despite Toras re-entering the picture then it would leave the opening for Lessi to realize her true feelings for Jad. Most of the internal and external conflicts are very organic and stems from setups in the previous two novels, however as I have mentioned more than once the romance between Dante and Alee in this novel feels completely forced and unnatural when she is constantly leaning towards Jad from crying out his name rather than Dante’s, he saved her from the most horrific place she has ever been, he helped her through her “sickness” and motivates her to get better and is always thinking of her even when Dante isn’t. The novel does avoid clichés for the most part, however, the insta-love between Dante and Lessi is a pet peeve for a quite a few readers as most prefer the slow burn type of romance that Jad and Lessi would have if you provided the opportunity to be together. The situation I wanted from this novel is similar to the situation the main protagonist in A Court of Mist and Fury finds herself in, she believes she was in love with one male character until a second points out the flaws in the relationship forcing her to open her eyes which should have happened here. Out of the three books so far, this one has the best pacing, book one seemed to fast paced with character and plot development along with world building being squashed together while the second novel seems very slow until a specific point is hit then really picks up, while this book has an even and consistent pace until the battle near the end of the novel where you’d expect that pace to be a lot faster. Another issue I had with this novel was the loss of Dante’s perspective which was several diminished compared to the previous two novels but given the character arc he takes over the novel, it wasn’t that much of a loss. However, I felt the time taken away from his perspective shouldn’t have been filled with Lessi’s perspective, it should have been filled with Jad’s or Lavai’s perspectives. For the most part, I really enjoyed this novel, however, as mentioned there were a few things that I didn’t overly enjoy in this installment. One thing that really hurt the novel was the ending. For me, there is too much resolution and not enough conflict left over for the next novel. I know the issue of the shield was solved but I felt that more internal conflict should have carried over, whether from Jad and Alee forming a romance, Jad and Dante trying to accept they are brothers, forming a triad relationship or something else, there should be at least one external and one internal conflict carried into the next novel as this novel could be seen as a conclusion to the story rather than having an opening for a new novel. My favorite character in this novel by far is Jad because he is perfect even in his imperfections. My least favorite character is Dante because he just does fit as the loving type he is a born warrior while Jad isn’t and trying to force him to fit both roles isn’t working. He obviously likes being a leader and takes pride in it makes this his dominant trait not is docile, submissive side it just doesn’t suit him anymore in the arc of character development. Lessi’s internal conflicts with the dreams and voice returning are the best aspect about her and the worst is how she at times bounces between the brothers stringing them both along when up until this point she has always made it perfectly clear when she truly wants something. I received an ARC of this book from the author however all opinions are my own. As in all of Lorraine's other books in the stories, I loved her use of imagery. It makes you feel like you are in Zeneshia, like you can see everything through Alessia's eyes. The plot is well developed as in her other two books. There was an interesting plot twist towards the end that I'm interested in learning more about in her next book Sequence Unbound. The ending was not what I expected, but that is good in a time when ideas are constantly being recycled. However, I feel that the slang can As in all of Lorraine's other books in the stories, I loved her use of imagery. It makes you feel like you are in Zeneshia, like you can see everything through Alessia's eyes. The plot is well developed as in her other two books. There was an interesting plot twist towards the end that I'm interested in learning more about in her next book Sequence Unbound. The ending was not what I expected, but that is good in a time when ideas are constantly being recycled. However, I feel that the slang can be distracting and sometimes there are too many metaphors, overcoming the beautiful imagery. Every book is even better than the one before and I just can't start describing it because words seem so meaningless now. As usual, thank you Lorraine for everything, starting with the copy and finishing in my astonishment with the book. Superb fantasy read as usual by this author. Just lost me in another world and impossible to put it down until I finished. Received an ARC. Reviewed because I love it and am ready for more. It is a wonderful series. Keeps you on your toes the entire time!! My vote Dante!!!!!!! Can't wait to read the next one. I have read 3 of the sequence books so far and will read the forth when it's available. The characters in the books are what will keep me coming back. The two brothers, the heroine, the grandmother, and the best friend and their relationship to each other. The Sequence part of the story still has me puzzled abit. I will probably have to read the series in its entirety again and perhaps again to understand it all.